Buy online Tactile Switch 4 Leg 12mmx12mm in India at low cost from DNA Technology, Nashik. Want to make your own keypad? Bored of using those small switches? 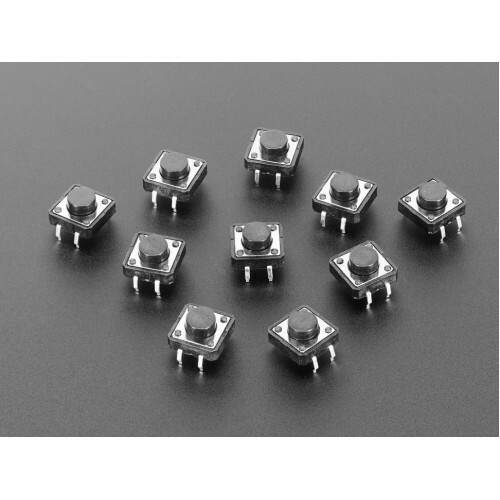 Use this big 12mm x 12mm tactile switches. These are good quality switches that you can use in your next project. Little clicky switches are standard input "buttons" on electronic projects. These work best in a PCB but can be used on a solderless breadboard as shown in this tutorial. The pins are normally open (disconnected) and when the button is pressed they are momentarily closed. Miniature Single Pole Single Throw switches. These are high quality Omron type B3F momentary on switches. Perfect as a tactile reset switch. Rated up to 50mA.